Ben Lewis, one of the Final Four at the Michigan Amateur for 2016. BATH – A Michigan State golfer, a University of Michigan golfer, a Grand Valley State golfer and a former Hope College golfer make up a young and strong final four in the 105th Michigan Amateur Championship presented by Carl’s Golfland at Eagle Eye Golf Club. Sam Weatherhead, the Spartan from Grand Rapids, will meet Reed Hrynewich, the Wolverine from Muskegon, in one semifinal Saturday morning, and Laker Domenic Mancinelli of Northville takes on former Flying Dutchman Ben Lewis of Holland in the other semifinal. Each of them won two matches Friday to advance. 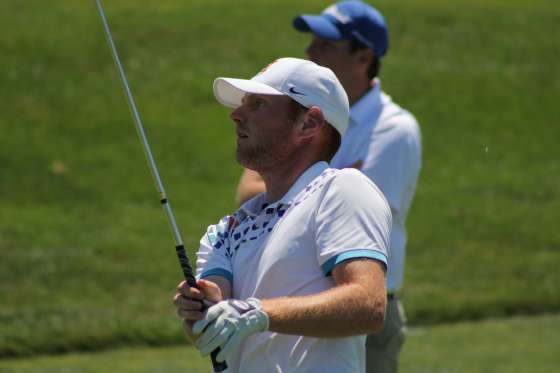 Lewis, 23, a 2015 graduate of Hope now working as a caddie at Wuskowhan Players Club near Holland and contemplating the possibility of playing professional golf, has been the giant killer of the tournament by taking out three former champions. He topped 2001 champion Andy Matthews of Ada 1-up with a birdie on the par 5 No. 18 hole in the afternoon quarterfinal, after topping 2006 champion Greg Davies of West Bloomfield 2 and 1 in the round of 16. He started match play on Wednesday with a first-round win over Randy Lewis, a two-time champion who like Davies is in the Michigan Golf Hall of Fame. Lewis and Matthews played a close match throughout and at 18 Lewis had 276 yards remaining after hitting his drive. The ball rolled on the front edge of the green, and he two-putted for a birdie. Matthews missed about a 12-foot birdie chance and the match was over. Mancinelli, 19 and a sophomore-to-be at GVSU, had to go extra holes to win both of his matches. He beat Oakland University golfer Jake Kneen of White Lake in 19 holes, and then beat 38-year old Shelby Township attorney Anthony Sorentino in 20 holes in the quarterfinal match. Mancinelli was 2-down to Sorentino through two holes of the quarterfinal and said his father and caddie, Joe, settled him down. Weatherhead, 21 and a senior-to-be at MSU, did his part in setting up the Spartans vs. Wolverines semifinal by beating Jason May of Birmingham 3 and 2 in the round of 16 and taking out 2013 champion Andrew Chapman, a former Wolverine from Traverse City, 7 and 5 in the quarterfinals. Hrynewich, 21 and a senior to be at Michigan, had to go 19 holes to hold off Nate Gunthorpe of Ovid in the round of 16, and then rolled to an 8 and 6 win over Dan Ellis, the assistant golf coach at Michigan State. He said all parts of his game have been solid, and he’s ready for another showdown with a Spartan. The semifinals round will start at 8 a.m. with the championship match likely around 12:30 p.m. Parking and admission are free. The complete match play bracket and results can be found at www.gam.org, as well as live scoring during play.